My husband and I moved to Downtown Seattle from the Ballard area about four months ago, and one of the biggest adjustments was learning where to grocery shop, and where to find a half gallon of milk for under $2.50. It’s the most commonly asked question by friends: “Where do you do your grocery shopping?” Now instead of getting in the car once a week and shopping, I find myself constantly on the lookout by foot for good deals on groceries since there are multiple options. The two most logical choices are City Target (1401 2nd Avenue) and Kress IGA (1427 3rd Avenue). I seek out the Target flyer in Sunday’s paper to locate the specials for the week. I’ve found some amazing deals on Peet’s Coffee, Hebrew National hotdogs, and even Nabisco chocolate graham crackers without driving all the way to Central Washington. IGA posts their specials on the top of the escalator that takes you down into the store. Their produce is remarkably good, and their beer specials are the best in town. Mexican Grocery, Pike Place Market. Photo by Joan Magnano-Damm. 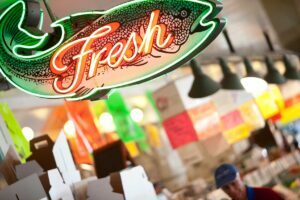 The Pike Place Market is a must for fresh fruits and vegetables, particularly at the Farmers Market on Pike Place on the cobblestone street between Pine and Stewart Street. The stalls are under white tenting between June and September. We’ve never eaten so many luscious raspberries and delicious blueberries as this summer, and it’s fun to experiment with new vegetables such as purple beans with their green innards and earthy taste. Another find at the Market is the Mexican Grocery (1914 Pike Place) for homemade pork or chicken tamales, fresh salsa and soft tortillas. 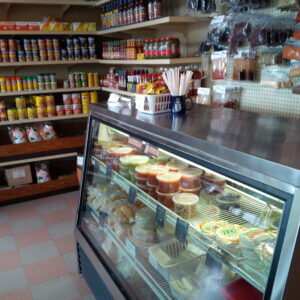 Cost Plus (2103 Western Avenue) is also the destination for a wide assortment of tasty cookies, from shortbread to pizzelles to biscotti, plus delicious lime infused chips to accompany the salsa. 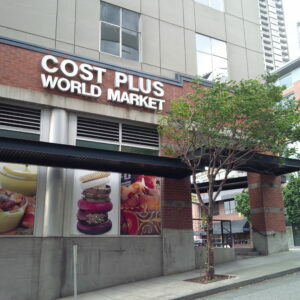 Cost Plus in Downtown Seattle. Photo by Joan Magnano-Damm. Another flyer I look for in Sunday’s paper is from Bartell Drugs with their two convenient locations Downtown (1628 5th Avenue and 1404 3rd Avenue) close to the central shopping district. They have unbelievable bargains on olive oil, energy bars, jams, and the list goes on. Then there’s Whole Foods (2210 Westlake Avenue), nicknamed Whole Paycheck by so many. But I’m here to tell you that if you look for their yellow tag specials, you can do quite well. Juicy Bing cherries for $3.99 a pound and five avocados for $1.00 can’t be beat. Next comes Macrina Bakery (2408 1st Avenue) for their wide assortment of tasty half priced day old bread that freezes beautifully. And to top it all off and round off the grocery list, there’s always QFC at Harvard Market on Capitol Hill (1401 Broadway Avenue E.). That’s where I can still find my $1.79 or less half gallon of milk, and still be within walking distance from all points in Downtown. So if you’re a visitor or a resident, never fear, you won’t go hungry in Downtown Seattle!